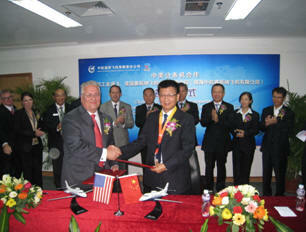 November 14, 2012 - Cessna Aircraft has entered into a joint venture contract with China Aviation Industry General Aircraft Company Ltd., (CAIGA) (through CAIGA South China Aircraft Industry Co., Ltd.), in accordance with their previously announced strategic agreement, for the formation of a joint venture company to conduct final assembly of Cessna Citation XLS+ aircraft in China for the Chinese market. As the largest general aviation company in the world, Cessna's relationship with CAIGA taps into what is expected to be the highest growth aviation market during the coming decade. Formation of the joint venture company remains subject to various government approvals and customary conditions.